Predicting the quality of machine translation (MT) output is a topic that has been attracting significant attention. By automatically distinguishing bad from good quality translations, it has the potential to make MT more useful in a number of applications. 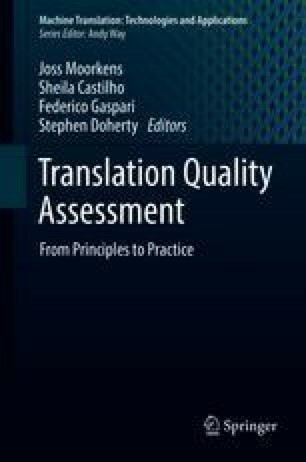 In this chapter we review various practical applications where quality estimation (QE) at sentence level has shown positive results: filtering low quality cases from post-editing, selecting the best MT system when multiple options are available, improving MT performance by selecting additional parallel data, and sampling for quality assurance by humans. Finally, we discuss QE at other levels (word and document) and general challenges in the field, as well as perspectives for novel directions and applications. We thank Arle Lommel for his help with setting up and running the error annotation for the experiments in Sect. 6.